The City of Rocks National Reserve in southern Idaho is one of the best rock climbing destinations anywhere. There are over 700 routes up the granite spires here, most of which range from 100-300 feet high, but can be as much as 600 feet. There are well maintained dirt/gravel roads and campgrounds in the reserve, which is a unit of the National Park System, but managed by Idaho Department of Parks and Recreation. There are few trails in the reserve, but access to most climbing destinations is not difficult. 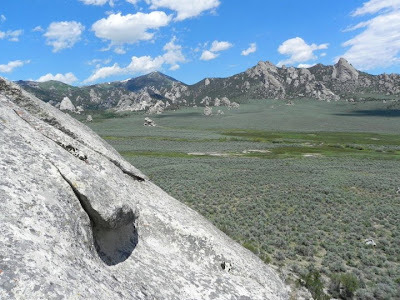 The reserve is near the Minidoka Ranger District of Sawtooth National Forest and Castle Rocks State Park in addition to being surrounded by BLM land.